Planning an election night party? Or, perhaps you’re reading this post after the Nov. 4, 2008 presidential election and want to decorate cupcakes for the Fourth of July or another patriotic event. This flag cupcakes fit the bill! 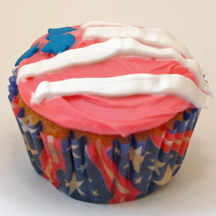 Whether you’re for Obama, McCain or even Nadar, there’s one thing we can all agree on: Cupcakes are yummy. What You Need: 1 cupcake; frosting tinted red (use no-taste red paste food coloring if you can); icing in aerosol can such as Betty Crocker‘s (or use pastry bag and ribbon tip); large blue confetti stars. How to Make It: Frost cupcake red. Attach ribbon tip to icing can and draw stripes across the cupcake, leaving a square at the top left area for the stars. Add blue stars. This entry was posted on Saturday, November 1st, 2008 at 8:43 pm	and is filed under Fourth of July patriotic cupcakes, social or political cause cupcakes. You can follow any responses to this entry through the RSS 2.0 feed. Responses are currently closed, but you can trackback from your own site.